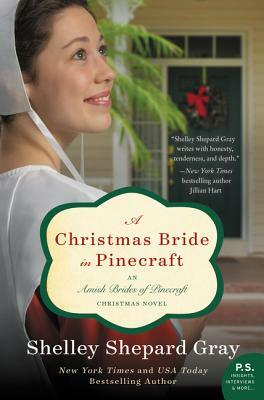 Beloved bestselling author Shelley Shepard Gray concludes her Amish Brides of Pinecraft series with a story of forgiveness and trusting your heart...just in time for Christmas. When Beverly Overholt’s beloved Orange Blossom Inn is broken into, she’s shaken to her core. After all, the inn has been her whole life since her fiancé left her for her best friend. In the face of repairing what’s been lost, Beverly calls Eric Wagler, the inn’s handsome owner. To her surprise, he promises to be on the next flight out to Sarasota. Beverly’s been closed off to love for years, but with Eric, she can’t help seeing a glimmer of hope—even if they’re from different worlds. From the moment Eric met Beverly, he’s tried to fight his attraction to her. Though now Mennonite, Beverly was raised Amish, but Eric grew up in Philadelphia and got into his fair share of trouble as a young man. Though he’s worked to overcome his earlier mistakes, with Beverly’s security scare, Eric’s sure she’s not going to want anything more to do with him. And considering how he might just want a future with her…that’s a tough pill to swallow. But as Beverly and Eric put the inn back together, prepare for Christmas, and even witness a new love blossoming for another couple, the trust…and love…between them grows. Will Christmas bring a second chance at love for Beverly? And if it does, will she be brave enough to take it? Shelley Shepherd Gray has written a charming story that is sure to please fans of Amish fiction. A delightful start to a new series! This contemporary Amish series-starter has something for everyone, including well-thought-out characters who hold their feelings close to protect their hearts. Gray writes about Amish life with charm and respect; she gives readers a glimpse into the simple way of life the Amish have embraced for generations. Shelley Shepard Gray brings readers into the Amish world with style and grace. Shelley is one of my favorites. An engaging, heartfelt story with characters who are easy to love. Sweet, heartwarming and wonderful. I savored every word. The beloved author of numerous Amish novels offers a sweet Christmas romance that has been written with exquisite skill. Readers of Amy Clipston, Marta Perry, and Beth Wiseman will certainly get caught up in the excitement of this story.